She met with John Kerry and visited with refugees in Virginia today. camera (Manuel Balce Ceneta/AP Photo ) Secretary of State John Kerry, right, with United Nations High Commissioner for Refugees Special Envoy Angelina Jolie walks to the Treaty Room at the Department of State in Washington, June 20, 2016. UNHCR Special Envoy Angelina Jolie Pitt called for action on World Refugee Day. Angelina Jolie Pitt made an appearance at the U.S. State Department in Washington, D.C., today, serving in her role as the United Nations' High Commissioner on Refugees. She met with Secretary of State John Kerry before both attended an interfaith Iftar reception to mark World Refugee Day in Sterling, Virginia. 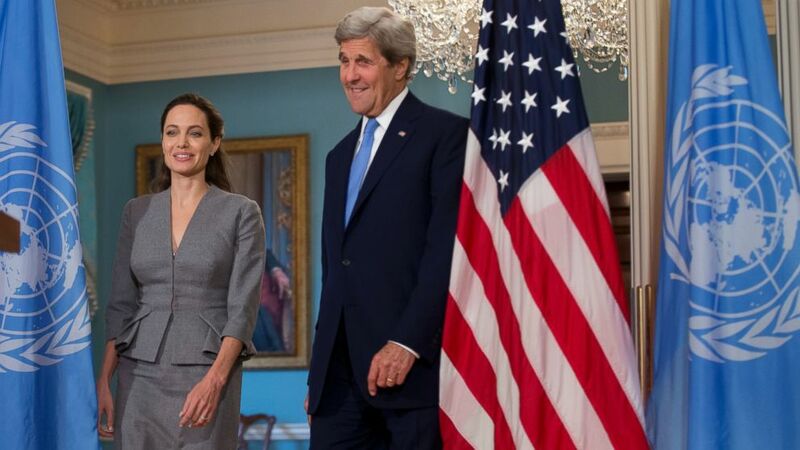 Kerry gave Jolie great praise for her dedication to the world's refugee crisis. "This is not a passing fancy for her at all," Kerry said. "It's a lifetime commitment." Saying there are 65 million people displaced by conflict in the world, Jolie asked that others "take a moment and to truly grasp what a refugee crisis of today's magnitude means for peace and security in the world." Turning our backs to the crisis would be "naive and irresponsible," Jolie added. She called on world leaders to find a "new approach, one that does not focus solely on aid and resettlement, but on solutions, stability and returns." She added: "Today, partly in response to this crisis, we are seeing rising intolerance and xenophobia. But strength lies in mastering and channeling our emotions so that we pursue policies that reduce, not inflame, threats to our security. We need leadership. We need solutions. So that is my ask and my focus today."